2 Loren: Why don't you ever call me, Ishmael? 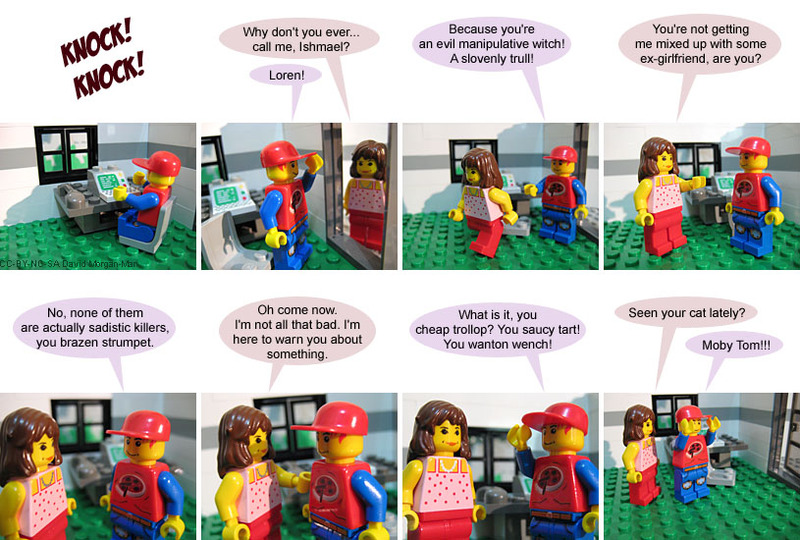 3 Ishmael: Because you're an evil manipulative witch! A slovenly trull! 4 Loren: You're not getting me mixed up with some ex-girlfriend, are you? 5 Ishmael: No, none of them are actually sadistic killers, you brazen strumpet. 6 Loren: Oh come now. I'm not all that bad. I'm here to warn you about something. 7 Ishmael: What is it, you cheap trollop? You saucy tart! You wanton wench! 8 Loren: Seen your cat lately? My mother was never worried about any of those foundless allegations that Dungeons & Dragons led to any sort of satanic behaviour or odd personality disorders, but perhaps it was just as well that she never flipped through the latter pages of the DMG. Last Modified: Sunday, 19 December 2010; 02:11:02 PST.